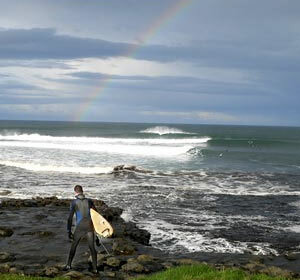 The beautiful village of Easkey, along the Atlantic coast of County Sligo, is recognised internationally as one of the most popular surfing destinations in Ireland. Surfing takes place in Easkey all year round. When waves break over rocks, rather than on to the sand, they are known as reef breaks. Easkey has two reef breaks - one to the left, just by the river mouth and another to the right, east of the castle. This makes the waves more attractive to surfers because they are hollower and faster than beach breaks. However, the breaks in Easkey are suitable for experienced surfers only, although surfing lessons are available at local beaches for the less experienced. Offshore winds are preferred by surfers and the surfing area in Easkey faces in such a way that the prevailing south-westerly winds are offshore. Easkey hosted the 1979 Pro/Am Surfing World Championships, putting Easkey firmly on the international surfing maps with the waves at their best on the weekend of that competition. Since then, surfing magazines from all over the world have featured Easkey and in 1997 it was listed as "one of the places a travelling surfer has got to visit" in Surfer Magazine, the biggest surfing publication in the World. In 1990, shower, changing and toilet facilities were built at the sea front by Sligo County Council and Easkey Community Council to cater for the increasing number of watersport enthusiasts coming to the village. In 1995 the Irish Surfing Association established its headquarters in the newly built Easkey Surf and Information Centre, where they now employ one full time development officer and one part time administrator. Surfing equipment can be purchased from the surf centre and daily surf reports are available also.